If you’re a PADI (Junior) Open Water Diver who is at least 12 years old, you can enroll in the PADI DPV (Diver Propulsion Vehicle Diver) Specialty course. The PADI DPV (Diver Propulsion Vehicle Diver) Course is for ages 12 Years and Older. For your course you will need the PADI DPV (Diver Propulsion Vehicle Diver) Crewpak. If you purchase your PADI DPV (Diver Propulsion Vehicle Diver) Crewpak at the time you book your course. Each student is required to purchase from us their own PADI DPV (Diver Propulsion Vehicle Diver) Crewpak. You will never swim again ! Get Your PADI DPV (Diver Propulsion Vehicle Diver) Course Certification Today. Dive propulsion vehicles or DPV as we call them in the diving world, are underwater scooters that make diving easy. DPV are one of the coolest ways to get around underneath the water. No more fighting with the current or having to swim let the DPV lead the way. As you are flying through the water effortlessly. You’ll wonder why you waited so long to take this course. 1. Demonstrate practical knowledge and planning procedures that make diving with a DPV fun. 2. Plan and organize dives to safely use diver propulsion vehicles within depths and conditions as good as or better than those in which the student has been trained. 3. Identify the hazards of DPV diving and demonstrate the techniques and procedures required to minimize those hazards. You begin the academics in the comfort of your own home. Once you sign up for the course, you will receive all the academic materials needed to complete the home study portion of your course. To start your course you will watch The PADI DPV (Diver Propulsion Vehicle Diver) course video and complete your knowledge reviews in your PADI DPV (Diver Propulsion Vehicle Diver) Diver Manual. This will get you ready for Your classroom session and the in water training portion of your class. 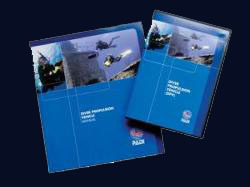 Open Water Training Dive 1 • Demonstrate the appropriate pre-dive preparation of the DPV used in the course. • Demonstrate how to operate a DPV while at the surface, including proper body position, preventing clogging the propeller, snorkeling under power and riding in tandem with a buddy. • Demonstrate how to make a proper descent with a DPV. • Demonstrate underwater maneuvering, including: a straight and steady course while gradually changing depth, and making pivot and banking turns. • Demonstrate the ability to maintain proper buddy contact while using a DPV. • Demonstrate the ability to follow the safety guidelines and recommendations previously discussed while using a DPV. • Demonstrate how to make a proper ascent and exit the water when using a DPV based on the conditions present. • Demonstrate the proper post-dive maintenance of the DPV used in the course. After this dive, the student should be able to: • Demonstrate the ability to independently plan and execute a dive using a DPV according to the procedures and safety guidelines provided in the course. For this class divers are required to have or rent a Dive Propulsion Vehicle.